Clark Stationery - Checkerboard - Cheers! Description: This invitation measures 5" x 7". 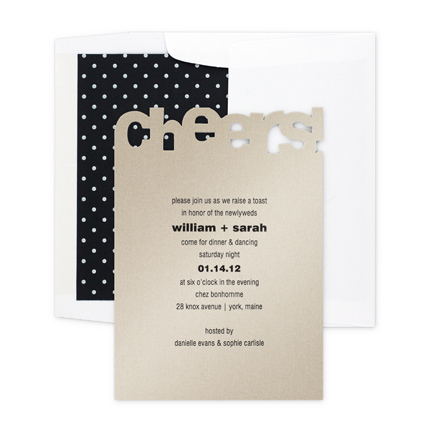 High-spirited and informal, this champagne-gold invitation spells out "cheers!" in die-cut letters, setting the tone for your information to follow. Celebrate anything from a wedding or anniversary to an office party with this lighthearted invite, accompanied by a whimsical die-cut RSVP card. Choose the color for your raised-ink text, then slip both cards into a wallet-flap white envelope. And if you need a finishing touch, consider adding the textured Dot Jet liner! Return address, envelope upgrades and envelope linings also available for this invitation. Price includes all assembly (if necessary). Response card also available. Quantities begin at 25, please inquire for pricing on any quantity.